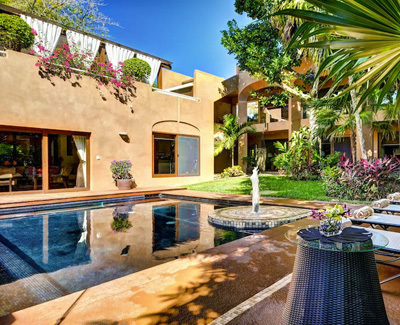 Located in very private and quiet gated community of Playacar, Quinta Clara is a magnificent luxurious villa that boasts the utmost privacy and tranquility. In addition to it's convenient and hidden location in the heart of Playa del Carmen, Quinta Clara is located just steps from the pristine white sandy beach and blue caribbean waters. Although, not beachfront, the villa maintains the privacy for low key yet discerning travellers looking to spend their vacation relaxing and getting pampered by the villa staff. Quinta Clara features a master bedroom with it's private infinity pool, and 6 additional equal suites with their own private entrances. The villa wraps around the ground pool and open garden areas, creating a large private courtyard for the guests to enjoy. In addition to the large exterior spaces, the villa offers a fully equipped kitchen, media room and living area. Quinta Clara is your home away from home and we look forward to welcoming you to this amazing luxury oasis!